Onondaga Lake was a very polluted lake at one point. It is located in New York State. When the lake got polluted we lost the opportunity to swim and eat fish from the lake. Honey well bought a companies called allied and then took the responsibility of cleaning up the lake. The clean up has been going on since the 1970s. In the video it shows honey well cleaning up the lake. The Pearson driving the boat has a very important job in cleaning up the disgusting polluted lake. This video shows some of the things that are from the buisneesses around Onondaga Lake. For example some of the bikes people are riding are from th bike shop. Also the playground and dog park were sponsered by wegmans. There are baseball feilds, skate parks, 7 miles in trails. 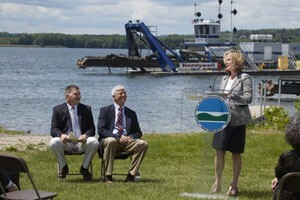 Working with hundreds of Central New Yorkers, Honeywell has cleaned up former factory sites, built the infrastructure needed for dredging, enhanced the lakeshore with native plants chosen by the community, and begun lake cleanup operations. The progress that has been made is due in large measure to the talent, creativity, and dedication of so many who reside and work in the local community – from the regulators and elected officials to the academic, environmental, nonprofit and business communities to Honeywell’s partners and workers. The Central New York community has important ties to Onondaga Lake. Today, hundreds of people who live and work in the area have an opportunity to be part of the cleanup and revitalization of Onondaga Lake. In cooperation with local partners, Parsons and O’Brien & Gere, hiring and purchasing are done locally wherever possible. In addition to being part of Central New York’s diverse and highly skilled labor force, local people bring a special sense of pride and commitment to the important work of achieving a sustainable and successful lake cleanup. It is with the cooperation, participation, and vision of an entire community – inspired by hope and progress – that we are able to help rebuild this essential ecosystem. Who Is Cleaning The Lake? More than 500 Central New York scientists, engineers, and skilled craft laborers have been working with Honeywell, achieving significant progress implementing lake improvement plans under the jurisdiction of DEC. Significant upgrades made by Onondaga County to its municipal wastewater treatment system plus the construction of Honeywell’s underground barrier wall, which prevents contaminated groundwater from reaching the lake, have improved lake water quality to the best it has been in decades. Probably one of the most fun things on our field trip were the bikes and salt museum. The women working at the salt museum were very nice and helpful to picture what salt mining was like and how valuable it was. The fun activity she let us do was be characters from the old days and the scrips had some very interesting history along with them. For example how father Lemoyne was one of the men that discovered salt. And while we were ridding the bikes there were some useful sings on the history and what we use the trails and lake for.